The goal of the Danish island of Samso, home to about 4000 people, is to power their island with completely green power. They heat their homes with grass burned in a central heating system. Their electric come from the wind, and they power their vehicles on biofuel which they also grow. Since 1998, Samso began converting its energy into renewable energy, and has been so successful that 100% of its electricity comes from wind power and 75% of its heat comes from solar power and biomass energy. With the completion of an offshore wind farm comprised of 10 beautiful turbines, Samso has become carbon neutral. 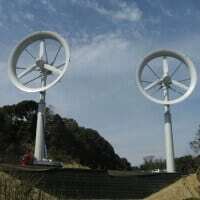 The energy produced by these wind turbines compensates for the island’s transportation emissions, including the ferries, and all other non-renewable energy sources. In fact, sometimes Samso’s wind turbines produce so much energy that the island sells it back to the mainland! It all started in 1997 when Denmark held a national competition. The selected winner would be home to a one-of-a-kind experiment: The winner would be expected to convert all its energy supply to 100% renewable energy within 10 years. Samso was given the nod. Because it is an island that has no conventional energy resources of its own, Samso was an ideal choice for such a controlled experiment. This is a remarkable achievement for such a small community. They published a report on how it was accomplished and financed – very little government money ( and none of it for the wind turbines ). Hi, Enjoyed your article an interesting read. Completely stupid. What did it cost? That money came from somewhere? What, the oil industry. Financial footprint is every bit as important as carbon, and are inseparable–but a bummer, unfortunately. Nice gimmick, but there’s only one answer, and it’s not turbines. It’s call reducing consumption. No point in arguing about it, because it’s self evident. Those that will, will–or those that won’t,well, won’t. This is going to become a matter of survival not ideology very soon. This post from some dude on an island in the middle of the pacific where they pretend to play with wind power too. . . The turbines pictured are possibly from another location in Denmark. I visited Samsø a few weeks ago and currently there are 10 turbines on land and 11 offshore. As for cost, the islanders invested shares in the turbines and now not only get their electricity for free, but make a healthy profit by selling the excess energy back to the mainland. Well Bob, what is the cost of non-renewables? You know us silly-greens will want to factor in things like the toll oil burning pollution takes on our lives as well as the the US defense budget which is keeping the world safe for oil elites. By the way don’t just figure in the billions spent in the current war, but please try to add in a coin or two for each loss of human life. Indeed, the cost of the wind turbines approaches zero in comparison to the REAL costs of an oil based economy. Can’t put a cost on renewable energy? What a ridiculous idea – no wonder Greens aren’t taken seriously. The only way carbon reduction will take place is through cost-effective carbon-neutral energy production – and if the energy comes from a sustainable source, so much the better. Cost? I don’t think you can put a cost on renewable energy. This is possibly the best news I’ve heard in quite a while. It’s also probably the best hope we have not to suffocate in the next 50 years. Not that it would be such a bad thing for humanity (to suffocate, that is) but we’re not alone on the planet. And I’m not talking about aliens. It says 10 turbins, but there are 15 in the pic! Which is correct? Good, now lets do this by country.